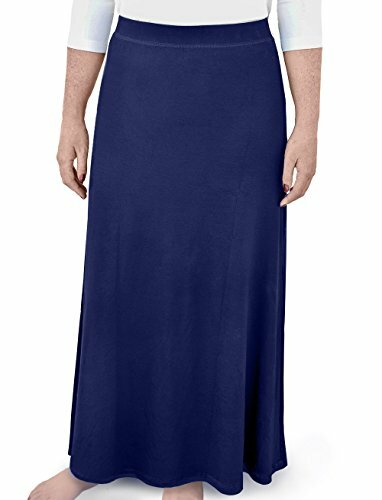 Kosher Casual A-line maxi skirt for girls is a very long skirt with a closed elastic waistband and no pockets. Made from natural viscose & spandex. 90% Natural Viscose/10% Spandex - Regular Fit. Ankle length. DO NOT USE DROP DOWN CHART - SEE SIZE CHART IN IMAGES OF PRODUCT.Kosher Casual girl's general sizing guide: Size 6 (S) Size 8 (M) Size 10 (L) Size 12 (XL) Approximate length waist to hem: Medium 25", Large 28.5", XL 32"
Reduced ship time - only 8 business days! Ships from Israel via the US Postal Service Economy International First Class Mail with tracking (EcoPost). NO signature required! Please note: Orders that do not have a secure location for the package will need to be picked up at the local post office or have a redelivery ordered via USPS.com. If a secure drop spot is not available, we recommend that you consider using an alternative shipping address e.g. business, neighbor, or family member. If you have any questions about this product by Kosher Casual, contact us by completing and submitting the form below. If you are looking for a specif part number, please include it with your message.